Developmental dysplasia of the hip (DDH) and idiopathic clubfoot are both common paediatric orthopaedic conditions. There is conflicting evidence in the literature as to whether the prevalence of DDH is higher in children with idiopathic clubfoot. The aim of our study was to systematically review the literature and determine the prevalence of DDH in idiopathic clubfoot. We searched several databases from 1946 to 2014 for observational studies that reported the prevalence of DDH in idiopathic clubfoot. We performed a meta-analysis using random effects model to pool the prevalence of DDH in idiopathic clubfoot. We also investigated the imaging modality utilised to diagnose and treat DDH in idiopathic clubfoot. Descriptive, quantitative and qualitative data were extracted. 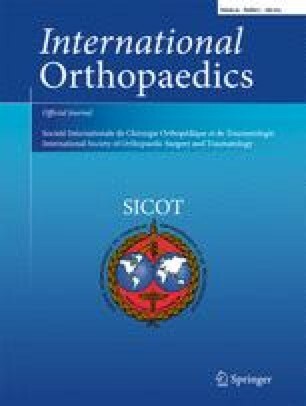 Twelve studies (ten case series, one retrospective cohort and one retrospective case–control) were eligible for the meta-analysis, with a total of 2,549 children with idiopathic clubfoot including 83 with DDH. The pooled prevalence estimate of DDH in children with idiopathic clubfoot was 4.1 % (95 % CI, 2.1–7.7 %). There was a substantial amount of between study heterogeneity (I 2 = 87.1 %, p < 0.001) due to variability between studies rather than chance variability. Sensitivity analyses showed that the pooled prevalence estimate was 3.5 % (95 % CI, 1.1–10.8 %) and 3.8 % (95 % CI, 1.0–13.7 %) for studies utilising ultrasound as the imaging modality of diagnosis and treatment with a Pavlik harness respectively. The overall pooled prevalence of DDH in idiopathic clubfoot is similar to the normal population. The cumulative evidence at present does not indicate an association between DDH and idiopathic clubfoot. Therefore, we do not recommend routine screening for DDH in children with idiopathic clubfoot. However, future retrospective and/or prospective cohort studies of better quality will be able to answer this question with more certainty.